Banned Books Week, held from September 23 – 29, is the annual celebration of the freedom to read. The theme, “Banning Books Silences Stories,” is a reminder that everyone needs to speak out against the tide of censorship. It’s especially important when considering books written by people of color whose stories, experiences and histories, have been either whitewashed, appropriated, censored or outright suppressed. So in recognition of Banned Books Week, we’ve put together a small list of banned books written by African Americans. We believe these books should be read for your own enjoyment, edification, or just to tick off a few people. In any case, it is our belief that the only way we learn, mature, and bridge divides is to share and debate ideas…even those we may completely disagree with. However, no person, community, or nation has ever achieved anything of note by turning away from knowledge. After you check out our list below, please leave a comment below recommending your favorite banned book written by a person of the African Diaspora. Those districts apparently couldn’t wrap their heads around the idea that talking directly about such subjects can actually clarify them for students. Suppressing these hormonal teens’ questions only leads to them being more confused and ashamed of the things going on in their heads and bodies. After a parent’s public complaint at a school board meeting, the superintendent of Katy (TX) Independent School District removed the multiple award-winning book from all the school libraries in the district. Teachers and librarians argued against the censorship, which produced overwhelming media uproar. A Katy ISD student circulated a petition gathering over 3,700 signatures to urge reinstatement of the book. The Superintendent held firm in his claim that the book was pervasively vulgar and he was legally right to censor the book. Three months later the critically acclaimed novel about a black teen dealing with the aftermath of witnessing a police shooting that killed her unarmed friend was returned to the district’s high school libraries, available to students only with parental consent. Believe it or not, Maya Angelou is one of the most banned authors in the United States. Her autobiography, I Know Why the Caged Bird Sings, has constantly been one of the most challenged books in the country since its release in 1969. Challenged as a summer reading assignment in the Knoxville (TN) high school system because a parent claimed the nonfiction book “has too much graphic information.” Henrietta Lacks was a poor black tobacco farmer whose cells – taken without her knowledge in 1951 – became one of the most important tools in medicine, vital for developing the polio vaccine, cloning, gene mapping, in vitro fertilization, and more. Banned in North Carolina prisons in February 2017 because it was considered “likely to provoke confrontation between racial groups.” The book was later removed from the list of prohibited books after the American Civil Liberties Union sent NC Department of Public Safety officials a public letter in 2018. A defeated bill in Arkansas would have banned books an materials written by Howard Zinn after 1959 in all publicly funded schools’ curriculum and course material. Zinn’s most popular work, A People’s History of the United States, is the only volume to tell America’s history from the point of view of women, workers, minorities, immigrants, and the working class, according to publisher HarperCollins. In response to the bill, the Zinn Education Project sent 700 free copies of The People’s History to librarians and teachers across the state. Stop by the store or check us out online to pick up a banned book today. 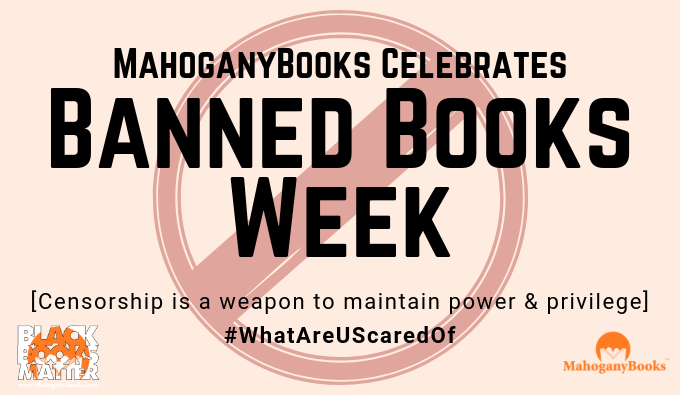 Please leave a comment below about your favorite banned book or let us know what you think about our list.